Sarasota is home to over 50,000 residents and is famous for its keys which include Siesta Key, Lido Key and St. Armand’s Key. 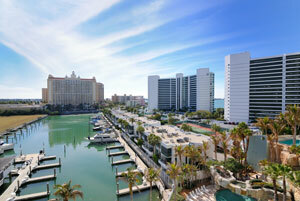 Tourism is a very large part of the economy of Sarasota with its famous golf courses, sandy beaches and warm weather. This has created effective advertisement opportunities near these tourist hotspots. For example, out-of-home advertisements in Westfield Sarasota Square and Westfield Southgate, two major shopping malls, would allow you to target your audience. The major highways that service Sarasota can also be utilized as an advertising strategy. Billboards on I-75, U.S. 41, or U.S. 301 would yield high traffic exposure of your business. Zip Codes: 34230, 34231, 34232, 34233, 34234, 34235, 34236, 34237, 34238, 34239, 34240, 34241, 34242, 34243, 34276, 34277, 34278.